Lake Compounce in Bristol, Connecticut is the oldest continually operating amusement park in the United States. The park recently added a Bear Creek Campground that features cabins, teepees, a tenting area, and, of course, a large RV area. The campsites are laid out with water-electric hookups located in a shared grassy area on the driver’s side of the sites. If the place is full, there will be a shared front yard between campers as well. Most people, I think, come to spend a few days at the amusement park. There’s even a shuttle operating from the campground to the main gate of the park. Our shortstop stay was just for one night as we traveled from southern Maine into Pennsylvania. The campground is about 10 minutes from I84 and the campsites are all pull-through, making it a handy place for an overnight stay. When I asked about discounts the lady I talked to on the phone offered me a nightly rate based on a three night stay rather than just one night. Here are a few things you might want to know. The sites are all water/electric (30/50 amp), no sewer. Individual shower rooms are available. There is campground WiFi – ours got slower as the evening progressed. There’s a nearby power plant that can be heard non-stop in the near distance. I had a strong 4G signal and, since the campsites are pretty much out in the open, satellite TV is no problem. The campground has a play area, but the main recreation is the amusement park. 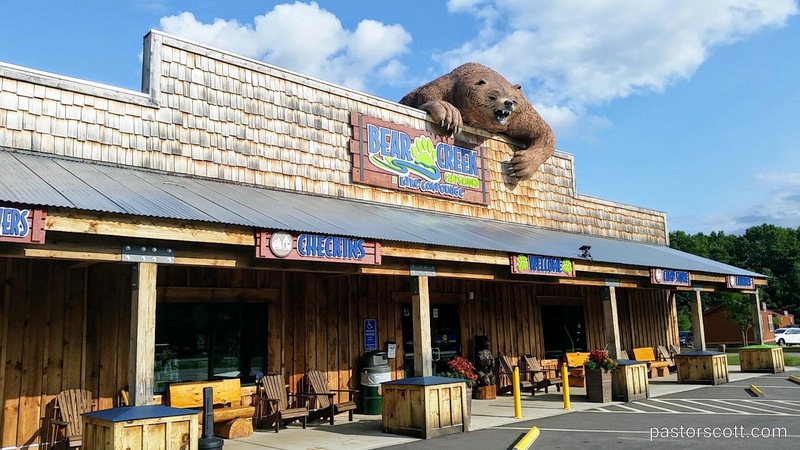 I think Bear Creek is a good choice for a stop in the Bristol, CT area.